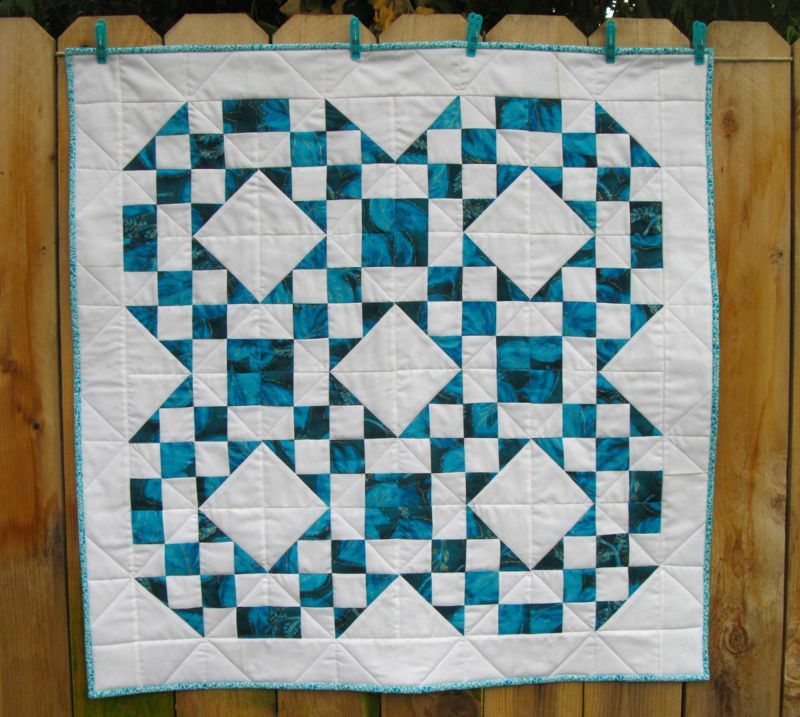 Pacific Grove Blues | OccasionalPiece--Quilt! Once again, it is beautiful! I like the idea of changing with the seasons as a table topper. Just keep them close where they can be enjoyed. 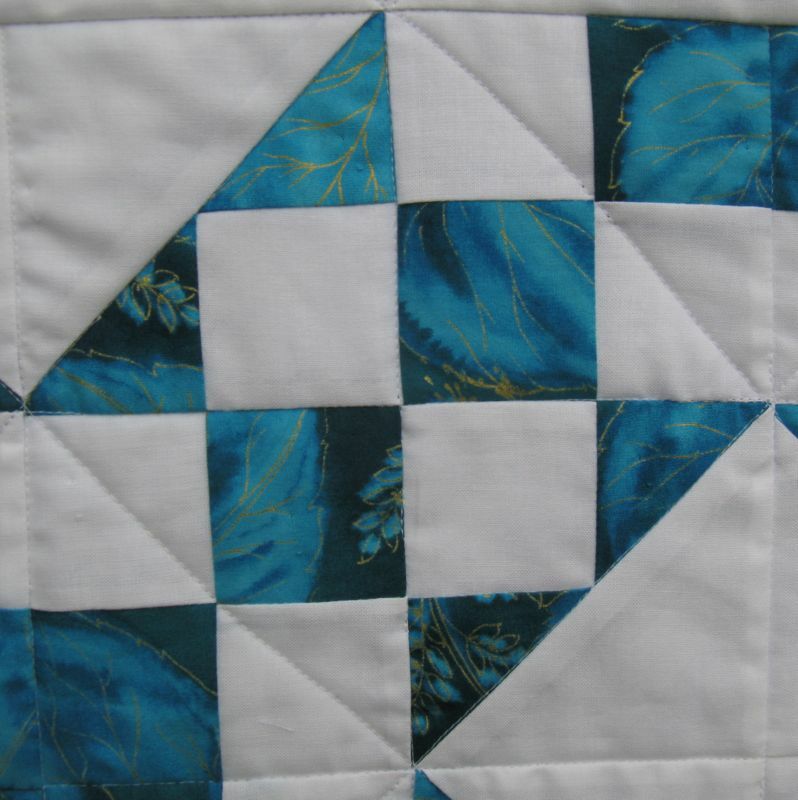 Gorgeous quilt….love the colours. Put some over the back of sofa or chairs. I am with Vicki….somewhere near. Soooo pretty. The colors are wonderful! Pacific Grove Blues is a lovely name. I have stacks of quilts as well. I don’t know what I will do with them. One is going to be donated this November to a church fundraiser. One of our daughters told me there is one bed and it needs only one quilt. You Schnibbles are all so lovely. I am almost at the stage of “Do I need to make any more quilts?” but all these minis/toppers are making me think again! I love the blues in this one! And it’s a great too! Lovely mini! And the great thing about minis is that they can become all sorts of things. Doll quilts for when granddaughters come to visit grandma and stay in the guest (doll) bedroom, tray liners, table protectors for putting under things that might scratch furniture but still need to be showcased by something pretty, floor cushions, wall-hangings… They rotate and are pressed into service wherever they are needed! I fell in love with this on Instagram! 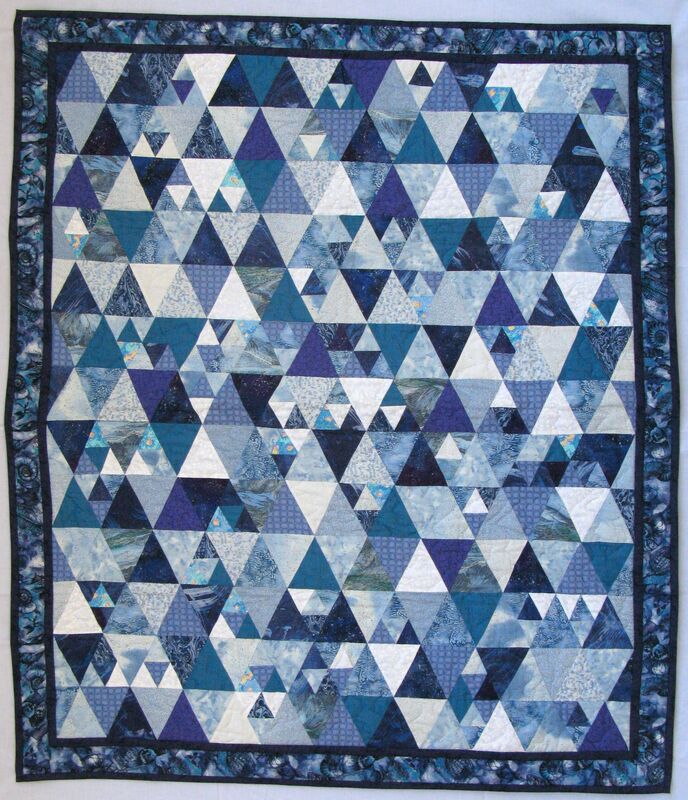 Love the blues and your photograph of the quilt with the others in the background. I enjoy seeing the variety of Schnibbles although I have never made one myself. 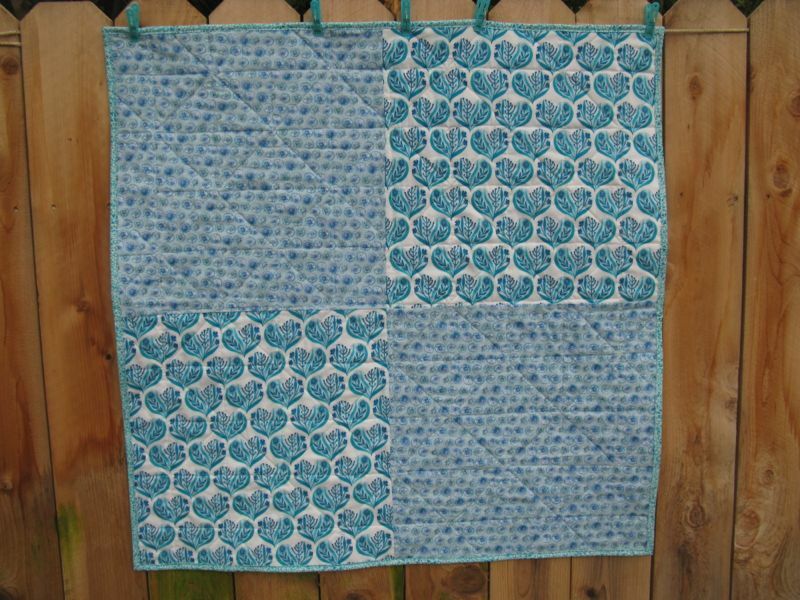 It is lovely, I really love blue and white quilts (and dishes too). I think that granddaughters might need more quilts for the dolls or they might be great stroller quilts for babies. 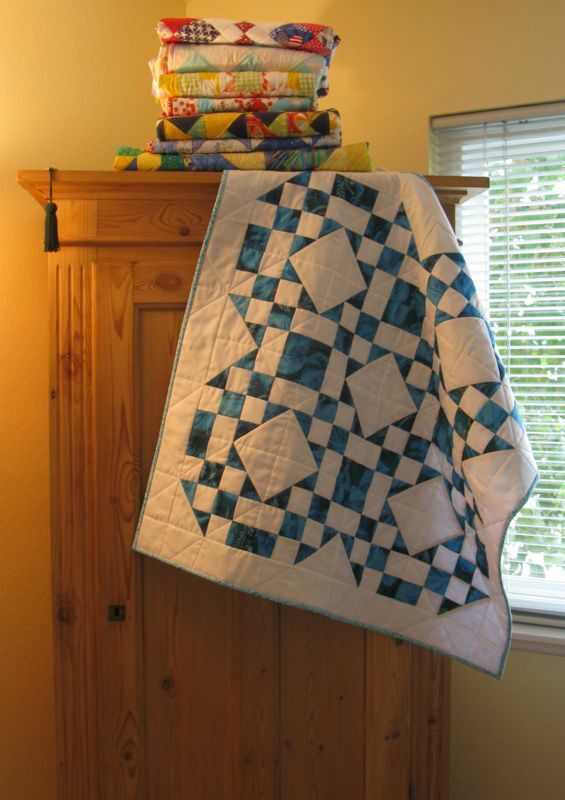 Or wall quilts for grandchildren or children? Hang on to those quilts. Some day you will have great-grandchildren but won’t be able to quilt anymore. These will be your legacy for them. I don’t know if this is something you’ve considered, but my motherinlaw loves to quilt as well, and is amazingly talented and she donates the quilts to local hospitals for the new moms. I love that!!!!! What a wonderful way for a talented quilter to enjoy the art without putting them to good use. Many women in our area have now got a new quilt for their baby because of my MIL. Just a thought! One of my quilting girlfriends is turning the large room of her living room into a gallery of small quilts. Some framed and some not. It spills over into some framed beauties on the end tables. Think a photo collage in fabric — very cool.